Join Angie Watkins and me in Georgetown, SC for a fun afternoon of wreath-making using luscious natural greenery. Bring an apron and gloves if you think you need them! Angie will, of course, provide us with delicious nibble to keep our creative juices flowing. Raise your hand and register below. Hope to see you on the 9th of December. Gather with new friends and old for a wreath-making class to get you in the holiday spirit. Join floral designer, Harriet Charles and hosts Austin Charles and Shelton Corbett, to create beautiful, all-natural, one-of-a-kind wreaths. The greenery, pruners, lots of instruction and nibbles provided. Bring an apron and gloves, if you’d like. Plan on attending with a friend? Buy your tickets 2 (3 or more) at once to make sure you get a spot. Space is limited. Gather at the Art Museum with your family and friends for a wreath-making class to get you in the holiday spirit. 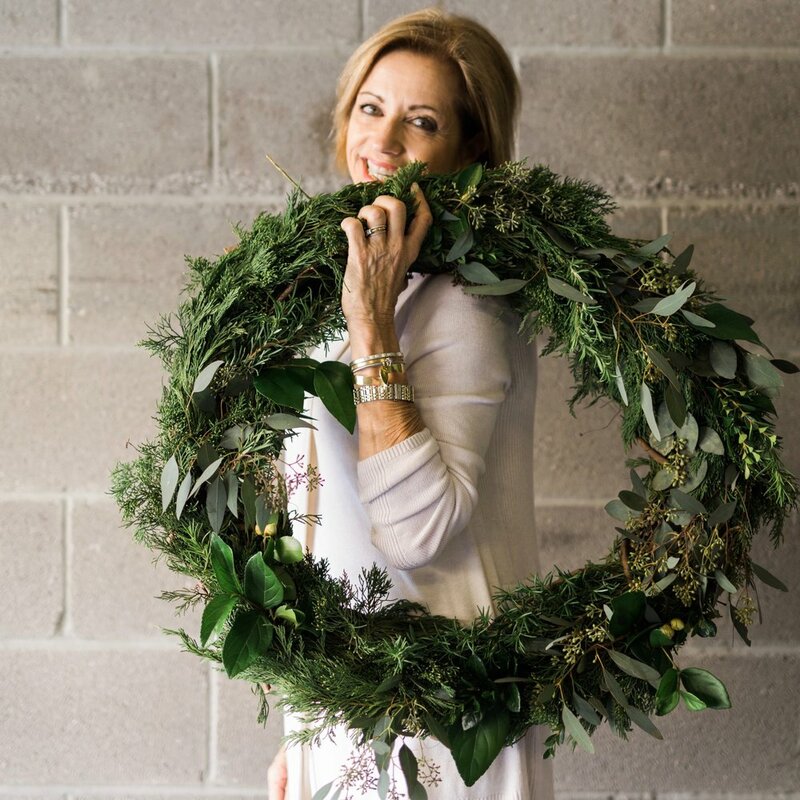 Join floral designer Harriet Charles of South Gate Design to create a beautiful wreath to brighten your home for the holidays using a mix of traditional greenery. A photographer will be on hand to capture you, your friends and your creation. A portion of each ticket will benefit the museum. Suitable for all skill levels. All supplies included. Bring an apron if you wish! Spaces are limited. As the days start to grow shorter and greens fade to oranges and reds, the change of seasons will inspire our arrangements of breathtaking beauty, accompanied by photo shoots that will capture the heart of our work. We will start the day with a fabulous lunch from The Big Tuna and then head right into instruction on the art of floral design. An inspiring array of flowers will be available for you to build your own romantic, garden-style arrangement. You will learn about the mechanics, color combinations, texture and much more. After learning the tips and tricks to making an arrangement, you will create your own romantic-style centerpiece, inspired by the hues of autumn. A photographer will be present to capture moments, the group, each participant, and each participant’s arrangement. If you come with sisters, cousins, your mom or your besties, we will be sure to get some group shots of you to last a lifetime! Digital photos will be available online approximately two weeks after the event. South Gate Design workshops are designed for all levels and flower friends who want to learn new skills or hone in on their existing ones. All you need to bring is an open mind and a grand intention! This getaway allows you to reconnect with nature, your soul, new and old flower friends, and your creative side. You will leave feeling rejuvenated after taking a break from your daily routine! Everything is included except transportation to the event. The vessel and blooms will be yours forever; clippers and aprons will be provided. You will go home not only with a beautiful vessel with a gorgeous, lush arrangement but also with the confidence that you can do this again—either at home or in another beautiful venue!